CCT released their FY 2016 Financial Results this morning. 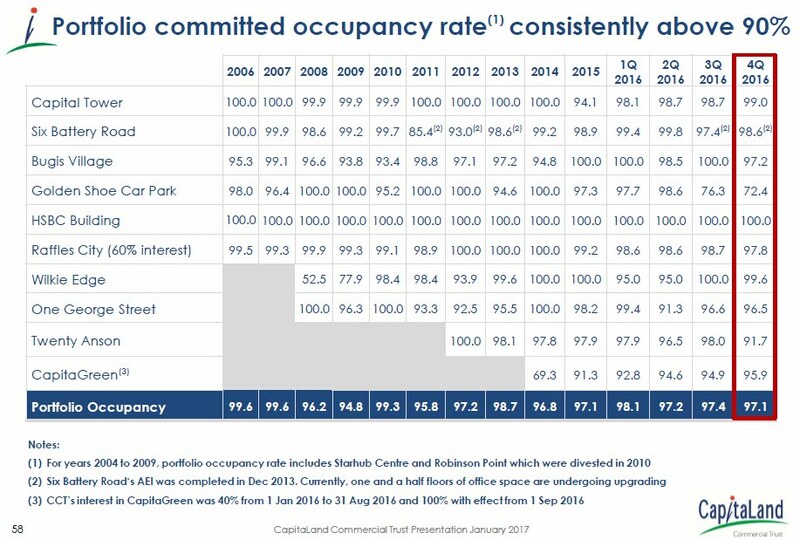 Seems a strong results for 2016 overall per se. 穷小子 shall touch on some of the key factors. Starting off with the much anticipated on CapitaGreen contributions injections to the portfolio. 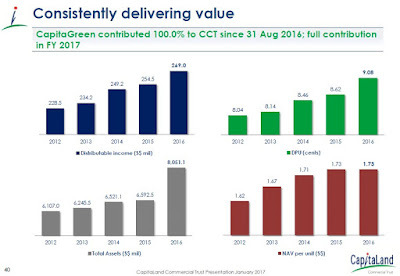 Note that its contributions is 100% only from 01 Sep 2016 onwards, so expecting the 11% to grow continuously for its full contributions in FY 2017. 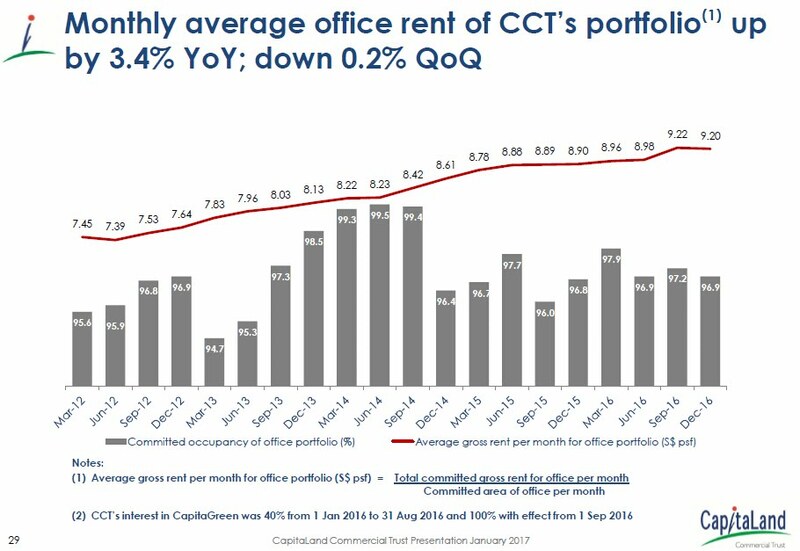 This will be a good news for investors, and if remember correctly, CapitaGreen was funded internally by CCT, with no rights issued that time. 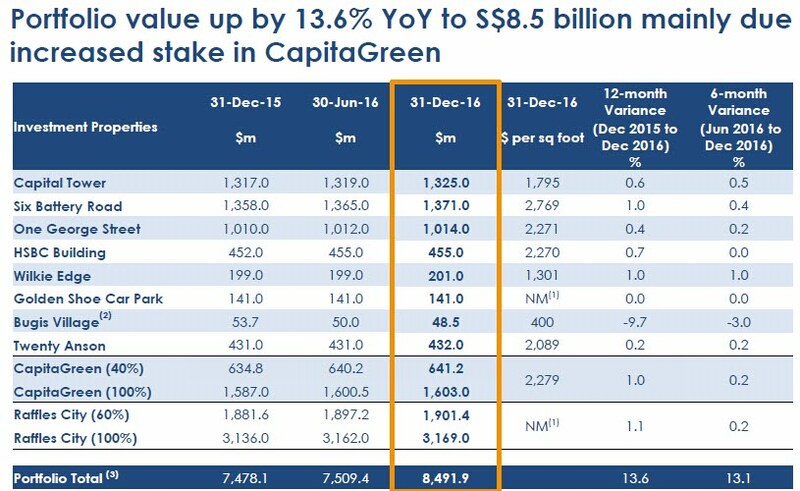 Portfolio was up by 13.6% YoY, and again mainly due to the increased stake in CapitaGreen. 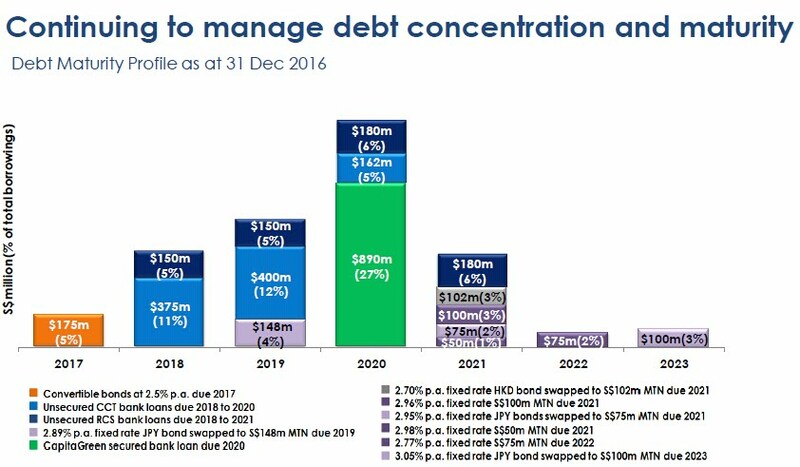 Debt maturity are evenly spread for the next 6 years with 38% matured on FY 2020. 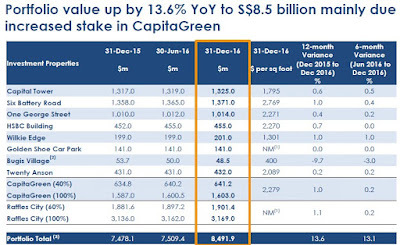 Once again, S$890M (27%) are due to the increased stake in CapitaGreen. CCT did measures to curb the interest rate hikes effects. 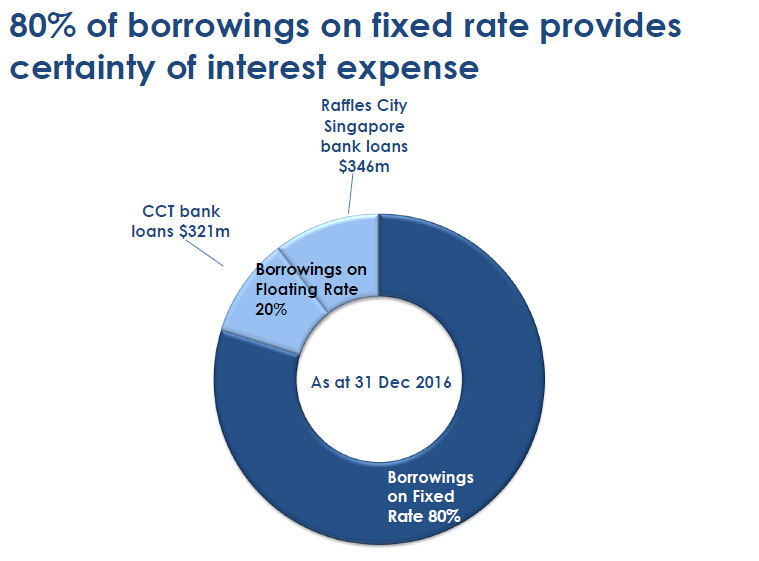 Only 20% of the borrowings are on Floating Rate. 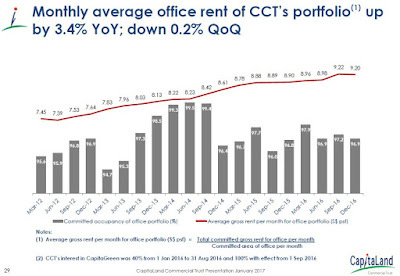 Despite oversupply of offices for past few years, CCT is able to consistently above market occupancy, ending the last quarter of 2016 with 97.1% against 95.8%. Although there is a dipped of 0.2% in the last QoQ, it has been an impressive increasing for the past 17 quarters consecutively. 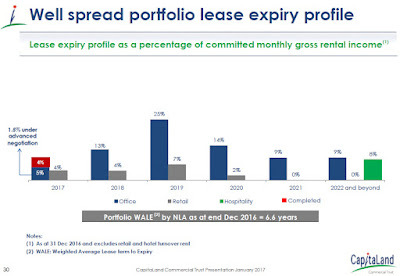 Well spread of portfolio lease expiry although with majority on 2019. 25% and 7% for Office and Retail respectively. Every investors' favourite, including 穷小子 too. 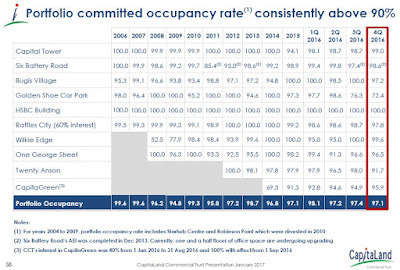 Income, Assets, DPU and NAV increasing consistently over the years. As Peter Lynch stated in "Beating the Street", "The dividend is such an important factor in the success of many stocks that you could hardly go wrong by making an entire portfolio of companies that have raised their dividends for 10 or 20 years in a row." 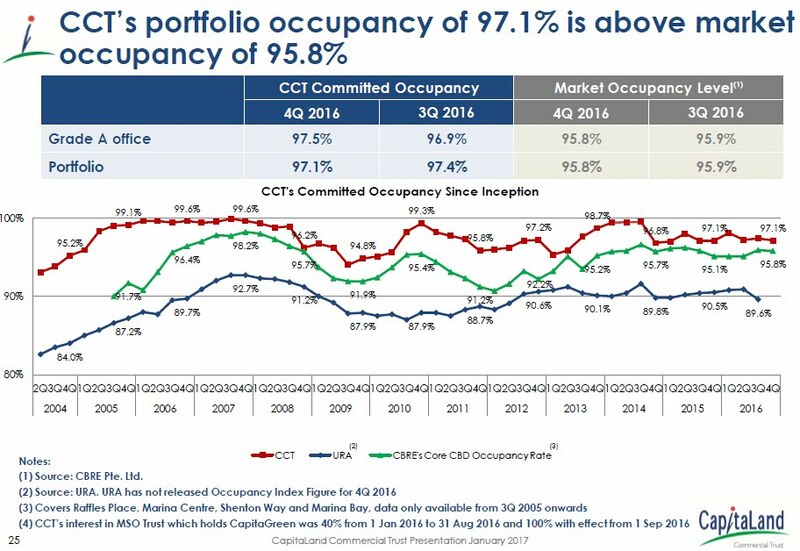 CCT's portfolio committed an impressive occupancy rate of above 90% consistently for the past 10 years. If omitted the 94.8% in 2009 which is due to Global Financial Crisis, technically speaking should above 95% consistently. 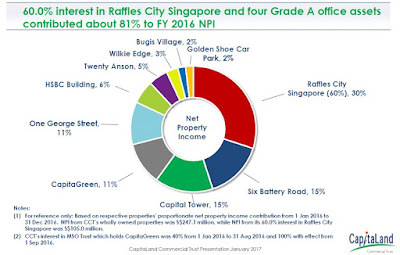 Maybe 穷小子 is bias and a bit of exaggerating in this review because this is the highest holdings REITs stock in his portfolio, but an impressive 10 years track records doesn't lies. 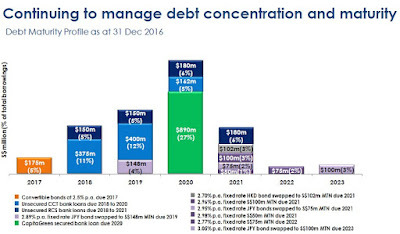 穷小子's concludes that this can be one of the "safe" stock for now until 2019 and 2020, the year which has the most portfolio lease expiry and the highest debt maturity amongst respectively. 穷小子 believes that the management will take necessary measures when the time are nearer. Vested in this too! 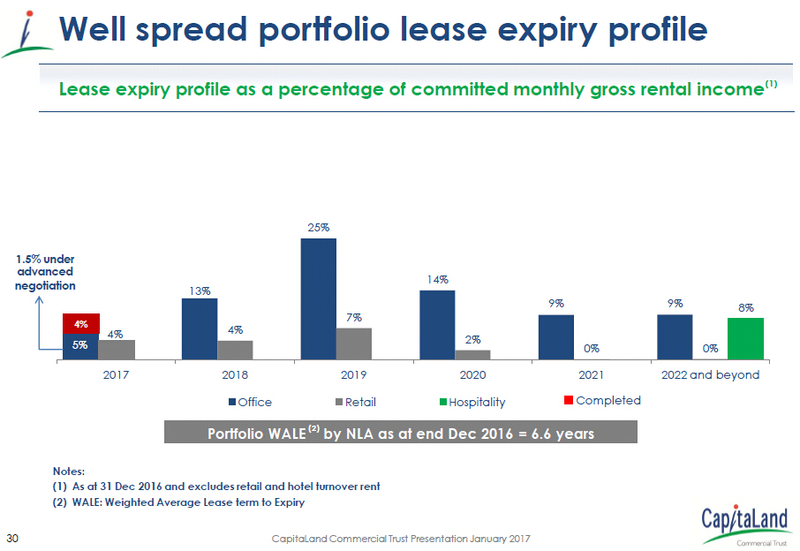 Lucky for FY17, only a small percentage is due for lease renewal. Hopefully, it will still be a positive revision. Nicely written. Vested in this solid counter too. Let's huat together!